This is one of those recipes that that is so simple you wonder how haven’t made them before. 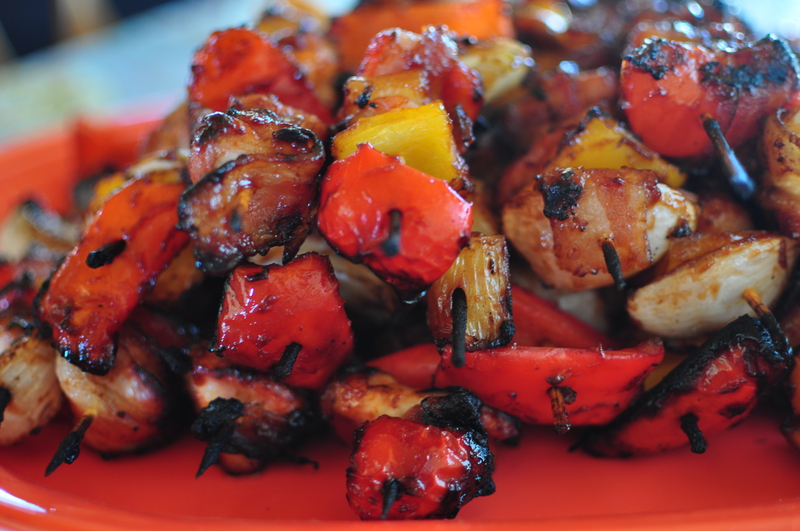 Grilled Chicken and Vegetable Skewers. Who hasn’t done that? But these are different. These have delicious, salty bacon woven in between all the chicken and veggies. Yes, bacon. Beautiful, delicious, fatty bacon. It caramelizes while it cooks and the saltiness make a perfect partner to the pineapple chunks and tangy barbecue sauce. It’s genious. I can’t believe I haven’t thought of it before. I can never make enough of these. They are great for summer outings and I tend to make them for dinner often with a side of rice and a salad. I usually make extra so I can take some for lunch the next day as well. Sometimes I actually have some left to take for lunch the next day. I suggest you try these sometime soon. The prep time can take a little while, you know with all the chopping and skewering going on. But it really isn’t all that difficult or time consuming. If it was, I wouldn’t make them. You know me. That’s how I roll. Start the skewer with a pepper then start the bacon and continue winding bacon through each item alternating everything, in no particular order. No rules here. Once everything has been skewered, baste with barbecue sauce and place on the grill. I don't skimp on the sauce. I load it right on! Cook, turning several times, approximately 15 minutes until cooked through. They can be a bit of pain to turn, as things tend to spin on the stick, but don't lose heart. You'll get the hang of it. No worries if something falls off the stick. Just grab it off the grill and throw it on the plate. It's still delicious. Now kick back on the deck with a cold beer and some good friends and enjoy!